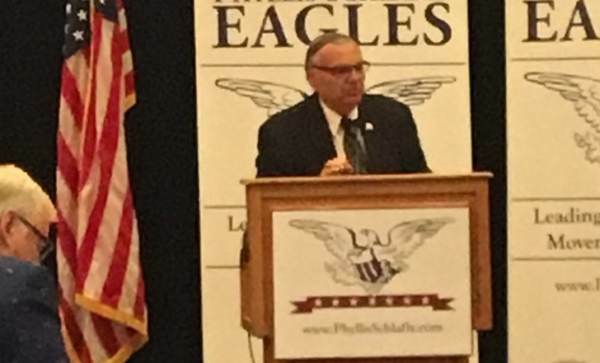 Former Sheriff Joe Arpaio was the keynote speaker at the Gateway Eagle Council XLVII Sunday luncheon. The former sheriff was pardoned by President Donald Trump in August 2017 after Obama committed the entire might of the US government to destroy him. And after years of investigation all the Obama team of partisan crooks could come up with was a misdemeanor. On Sunday Joe Arpaio cut loose on Barack Obama. Arapio was talking about his experience introducing Donald Trump at an Arizona rally in 2015. Joe Arpaio: I hit him on another thing that I don’t really want to talk about. But let me just say this, it happens to do with fake government documents. I think some of you will know what I’m talking about. And I’ve been in law enforcement for over 55 years. One think I learned was you always make sure you get the probable cause and evidence before you go public. So you have to take my word for it, over all those years, that that document, I’m not saying which one… Is a Fake!